The Pink Ladies in the number “Freddy, My Love” from “Grease”: Carly Haling, Ryann Sheehy, Virginia Garey and Lauren Rider. In show business, you have to show that you have a show, so the audience will show. 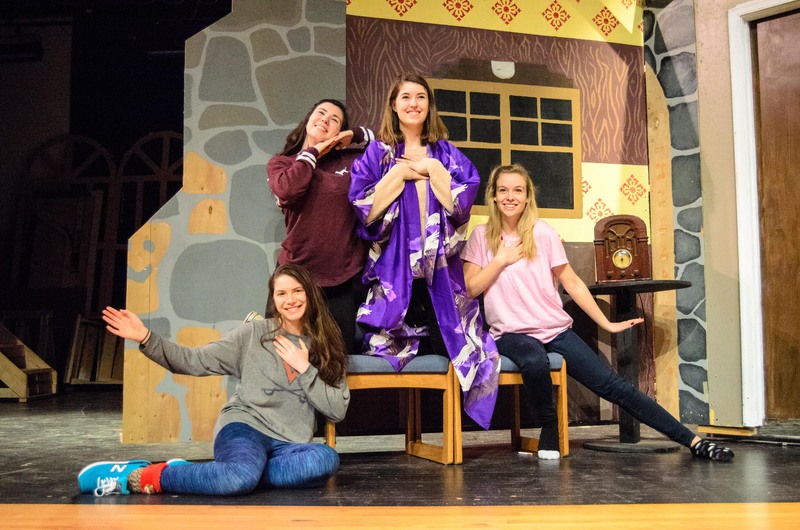 Western Albemarle High School (WAHS) drama students are not only rehearsing for their March 24-26 run of “Grease,” but also promoting their production at other venues and in media. Due to mainly to the higher-than-average fees for show rights, the school’s drama department has acknowledged that publicity will play a vital role in filling the seats. To help create public awareness, castmembers are managing obligations of intensive choreography, vocals and scripts, along with mini-shows at The Lodge at Old Trail (March 2) and Henley Middle School (March 16), as well as live interviews on WINA Radio’s The Schilling Show (March 15). At press time, the cast is hosting a fundraising cabaret, “Broadway In Crozet,” performing numbers from stage and film musicals. The production is also using new media via its official Facebook fan page (WAHS Drama Presents “Grease”) to publicize their events. Visitors will find post behind-the-scenes video and photos, along with a schedule of events and ticket-ordering link. The publicity campaign has gathered steam, prompting local personalities and officials to appear in an upcoming video for the Facebook page in the next two weeks. Among them are Channel 19’s Chief Meteorologist Travis Koshko, Rob Schilling and Channel 29’ Anchors Matt Talhelm and Kasey Hott “auditioning” for roles. For more information about events and tickets, visit the production’s official Facebook page at WAHS Drama Presents “Grease.” Otherwise, tickets can be purchase online at ticketriver.com.